Inspired by the community dialogue and a determination to seek ways to elevate our practice, in the summer of 2017, Ikazuchi Dojo developed a new seminar format and collaborated with Roy Dean to design the first event using the framework. We’d love to have you read the story of its development and give us your feedback. 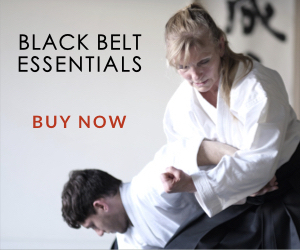 A new breed of seminar designed to build specific skills, empower instructors with tools to share new knowledge with their dojos, and cultivate friendships with progressive leaders in the aikido world. This is definitely a departure from the standard aikido seminar model. We love hosting traditional weekend seminars with a large group of participants. This format isn’t designed to replace that model, but instead to provide a very different experience. These events are designed to build targeted skills, empower instructors, cultivate friendships, and open doors for future collaborations and knowledge exchanges. With well defined learning objectives announced up front, instructors can determine if they have an interest in building knowledge and skill in a given area before committing their valuable time to an event. 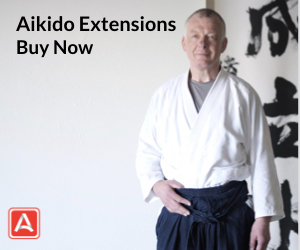 Aikido utilizes pins extensively and they are generally very effective. However, there’s a critical moment between a control or throw and a fully secured pin when the uke may have an opportunity to resist or counter the pin. We drew from Roy Dean’s 25 years of jiujitsu expertise and aikido background and collaborated to develop a set of responses to an uke’s attempt to resist or escape a pin. These responses are designed to be style independent and serve as natural extensions of our aikido. Roy and Josh have invested over 40 hours into technical research, curriculum design, and implementation with Ikazuchi Dojo instructors and select students. We’ve refined the techniques and optimized training methods to ensure a safe, fun, and efficient learning experience. Roy escapes an ikkyo ura control by spinning in front of the nage and grabbing for the legs. Josh responds by stopping his movement with a body weight application and moving into a hadaka jime (rear choke) while maintaining a highly mobile, standard aikido kneeling posture. As aikidoka, we practice pins almost every class. We wanted to invest in understanding them at a deeper level. As a group, seminar attendees will explore common aikido pins, learn counters, responses to the counters, and then pressure test the pins until we “own” them. We’ll use some new training methods that are powerful learning tools and great fun. We designed this seminar primarily as a learning event for instructors / chief instructors. Seeking a diverse group, we’d like to see 1-2 instructors to join as ambassadors from a single dojo. If someone would like to join the seminar and is not an instructor, we’d be happy to hear their story and see if they’d be a good fit for the event. Provide a short personal bio that will be circulated to all participants before the event. Practice and build proficiency with 1-2 movement exercises prior to attendance (details will be given after registration). Read selected sections of Aikido Ground Fighting by Walther von Krenner, a direct student of O-Sensei. (Optional) Provide videos of you demonstrating some of your seated and standing pins. We’d love to learn from you and seeing everyone’s pins will allow us to better fine tune the curriculum. Full Day Seminar: Hosted at Ikazuchi Dojo in Irvine, CA. Limited to 20 participants. Workshop Blueprints and Tools: Blueprints for instructors to run their own workshops based on the seminar curriculum. Includes detailed instructional outlines for two separate workshops, promotional assets, and a post-event participant survey. Anonymized, aggregated survey insights will be made available to everyone that contributes data. We’ve structured this so an instructor running a single version of each workshop with 10 participants @ $25 can subsidize the cost of attending the seminar. Videos: Participant exclusive video content. Follow-Up Livestream: Two weeks after the seminar, Roy and Josh will lead a livestream to answer questions and learn about new discoveries form attendees after they experiment with the seminar curriculum back at their home dojos. Private Discussion Group: Participants will be given access to a private online discussion group to stay connected with each other and share insights and research over time. Exploring variations: looking at new variations of standard seated pins and understanding their strengths and weaknesses. Kaeshi-waza (reversals): Understanding how an untrained partner and a trained ground fighter may attempt to counter or escape our seated pins. Kaeshi-waza responses: Tactics and techniques to regain control of a resisting partner after a counter or reversal. Flow practice: We’ll pair up and use controlled resistance and countering to contest a pin, allowing nage to pressure test and build fluency with new movements learned in the seminar. Show and Tell: Participants can share details related to their style of pins and ask questions. We expect some will have interesting variations to share. Some may also have problems related to a pin they can’t solve and we can work through it together as a group. Lunch will be provided. During the lunch hour, we will have an HD slideshow featuring a series of unreleased photos from the Aikido Journal archives. 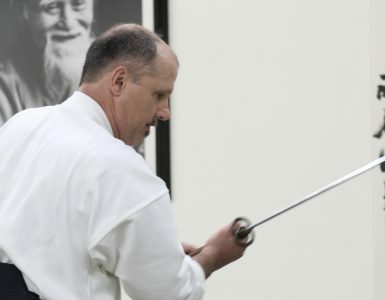 The Noma Dojo collection has at least 50-100 pictures of O-Sensei executing pins and controls not commonly seen in modern aikido. Many of these photos have never been shown publicly. As a group, we’ll review these photos and talk about the various pin applications, some of which are very similar to the techniques we’ll practice in the seminar. Morihei Ueshiba performing a head and arm choke variation from modified seiza. Roy will lead a short narrated jiujitsu demo and talk about how he uses aikido in his jiujitsu. He’ll show a few of his favorite ground-based techniques and explain the underlying physics and biomechanics in a way aikido instructors can appreciate and draw insight. Experience the ground (optional): Any participant who’s interested can feel what it’s like to navigate the ground with a jujitsuka who has the finesse and control to make the experience safe, fun, and comfortable. General Q & A: Anyone can ask questions — technical or general. Exploring the Gap / Kaeshi-waza: Standing pins are usually applied when the opponent is in a prone position (face down) from a control like ikkyo, or from a supine position (face up) from a throw like kotegaeshi or shihonage. We’ll explore methods a partner can use to escape, attack, or counter during the critical transition between a throw and securing a standing pin. Kaeshi-waza responses: We’ll learn effective and reliable tactics and techniques to regain control of a resisting partner after a counter or reversal. Flow practice: Fun training methods with controlled resistance and countering, designed to improve our proficiency with these new movements and responses. Learning to make it work in a (friendly) pressure tested environment. Show and Tell: Participants can share details and ask questions. As a group, we can talk through solutions to problems anyone has with their pins or ground control of an uke. Kaeshi-waza: In aikido, technique counters and reversals are usually reserved for high-level practitioners only. Many other arts teach counters as an integral part of the instruction of a technique – even to beginners. 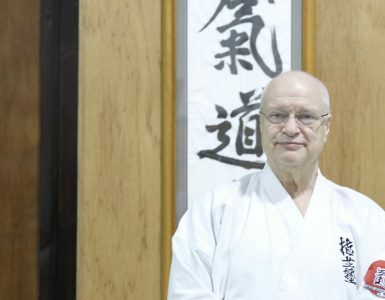 While in the minority, some senior-level aikido masters have advocated earlier introduction of kaeshi-waza into students’ training. Is this a good idea? What are the implications? Takemusu Aiki: The Founder believed that the highest level of aikido is takemusu aikido, the spontaneous creation of aikido applications for an infinite range of challenges. If this is a worthy goal for aikidoka, how do we reach it if the vast majority of our training time is devoted to scripted kata practice? We’re definitely exploring beyond the boundaries of the standard aikido seminar model with this event. Inspired by the Aikido Journal community and the wisdom of some of the great masters, we’ve poured creative energy and rigorous testing into this project. We’ve been humbled by the support we’ve received from the community that lies at the heart of this story of friendship, knowledge exchange, and creation. We’d also like to offer a special thanks to Haruo Matsuoka Sensei for supporting this project and providing us with wisdom, guidance, and encouragement. If you have any feedback on the seminar format design, please leave us a comment. We’d love to get insights from the community so we can learn and improve. Sounds like a great seminar! Only I can’t find the dates of the seminar…only times. Unfortunately, I live in Japan, so attendance is not possible, but hope that you can put information gathered at the seminar online for others! Our dojo is in a slump recently and I want to try something to encourage everyone to get the spark back again!! We live quite isolated from other dojos, but have semi-annual seminars with shihans from Hombu dojo. They follow the typical pattern of weekend seminar, but it is a good chance to meet up with others and enjoy training! But your blog offers me inspiration and new ideas, so thank you so much! Good to hear from you! The date is July 15th. It was on the title image for the page but I just put it in the body text as well so it’s easier for people to find. Thanks for the tip on that. We’ve tested out some of the curriculum with a few students at Ikazuchi Dojo and they love it. Everyone has fun with the movements and it gives them new practical tools. It can definitely spark enthusiasm. You are most welcome and thank you for the support and encouragement! Just an FYI, other than the your comment above, the date is a no-show on the mobile layout (tested: Android 7: Firefox, Chrome, and Dolphin) of the page. Date does not appear on an iPhone. Thanks! Just added in some text to the seminar landing and registration page. Do you have a link to the Seminar Registration? I am not seeing one. As a long time Aikidoka, Jujitsu and law enforcement defensive tactics instructor, I agree with you completely. Your collaboration with Roy Dean is great and innovative. I have been instructing “options” for pins and reversals for years at my facility. Any Aikidoka that DOES NOT change with the trends is living/training in “la-la” land. I have even participated in seminars and introduced different ideas to basic Aikidoka. It was never well received. I have always been titled as “too hard”. I live in the New Jersey coast line area. There are a plethora of jujitsu facilities in my area that challenge Aikido all the time. We also have too many Police Officers ONLY training in basic jujitsu which is dangerous for their gun retention abilities. I try to make sure that the officers that train with me get the best of two worlds. I concentrate on handcuffing technique’s for officer survival. Unfortunately, I will NOT be able to attend your seminar due to other obligations. Hopefully, you will make the seminar available on video for purchase, or be willing to bring it to the east coast. As I understand this is a 1 day clinic, correct ? Will there possibly be a DVD release ? Good to hear from you Ernest! Yes, this is a one (long) day clinic with follow-up livestream, curriculum blueprints, etc. It’s possible we may do some kind of video related to the event but we’re not sure yet. We’ll keep you updated if we do have any publicly available video we release. Thank you for your feedback and support. I practice 2 pre-war forms of Aikido / Aikijutsu and began my martial arts training in 1974, so I am always looking to improve upon my art. As a former greco-roman wrestler I do love the ground game and personally have seen that arena (ground fighting) as a major weakness in any “Stand up” martial art. I look forward to hearing about the outcome of the clinic. Thanks so much for the support Ernest. We’ll definitely plan on updating everyone on the outcome of the seminar. Nice to meet you here! Sounds great! I love the content and the idea of longer term follow up. 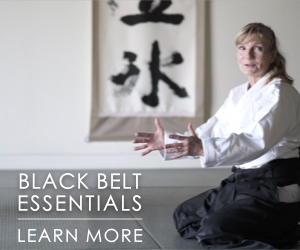 I know my dojo’s instructors and myself could use development in the area of having more responsive and spontaneous technique – but we also believe in building a strong foundation of basics. Your thoughts on the pull between these two, and how/when you start to teach these applications? Hi Laura- Thanks for the feedback. We totally agree about the importance of building basics. This is one of the areas we are exploring in some detail now – when to start to introduce more free form practice, henka-waza training, etc. We don’t have an answer yet, but currently we focus on building a strong basics foundation for students before 2nd kyu and introduce them to some of these concepts in special weekend workshops, etc. After 2nd kyu, we start to thread in other training methods that start to develop more responsive / spontaneous movement. I see a huge difference in the aikido of those that start to allocate a measurable portion of their training time to more spontaneous / jiyuwaza as they get to higher levels though. Thank you for joining the conversation! 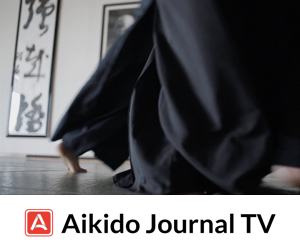 I’ve been following Aikido Journal for awhile now and it’s great to see how regular seminar can be switched up. Unfortunately I live on the other side of the world (Singapore), making traveling over for this event not practical. If this seminar can be placed online/post seminar media for others (as echoed in this thread), it would be most helpful.